The 1980s were a LOUD decade, at least rhythmically. So let’s all blame Phil Collins. (Actually, let’s NOT blame him, because it’s not ALL his fault.) 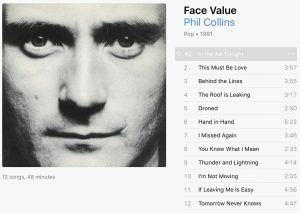 Phil Collins is credited for inventing the “gated reverb” drum sound (ironically it was first performed by Collins, but on Peter Gabriel’s third solo album), because it was his single “In The Air Tonight” from 1981’s Face Value (revived in 1985 by plays on Miami Vice) that brought it to the mainstream. Due to that success, along with the proliferation of the Linn Drum in the mid-1980s (look for a future post on that instrument), the drums often became the loudest instrument in many of the era’s classic songs. Loud drums you say? Two early examples were “Modern Love” (1983) by David Bowie and “Some Like It Hot” (1985) by The Power Station, both of which were performed by the late Tony Thompson. By 1985, even veteran guitar-based acts (Heart – Heart, Eric Clapton – Behind The Sun, Cheap Trick – Standing On The Edge) were releasing albums that stepped up the drum effects (and synths) to bring the sound up to date. QR’s bassist Rudy Sarzo bailed and fans, contemporaries and even the band’s label turned on them; the band was put on double secret probation by its record label. An attempt to regain composure by becoming more “contemporary” backfired; the resulting album QR III (when in doubt, name your album with a number) flopped. DuBrow was canned shortly thereafter; Quiet Riot has lived on, in one form or another, almost continuously since then. A new producer (Peter Collins, known for his work with Rush and Queensryche) was brought in, and listening to the track today, the label’s request was met. Unfortunately, both the single and album stiffed and Squier’s career as a hitmaker, over. Like Quiet Riot and Billy Squier, Chicago found itself in a hole by 1986. After a decade plus-long reign at the top, the band was considered dinosaurs by the early 1980s. A musical makeover turned the once-progressive outfit into slick hit makers, courtesy of producer David Foster. Following a string of huge singles between 1982 and 1985, bassist Peter Cetera – the voice (and face) of all those hits – abruptly quit the band after the successful Chicago 17 tour and launched a successful (for a while, anyway) solo career. Bassist/vocalist Jason Scheff, all of 24 years old – was hired as Cetera’s vocal doppelgänger and Chicago soldiered on with the creatively-titled Chicago 18. However, in an attempt to bridge the old and the new, the first single by the reconstituted band was a drum-heavy remake of its classic “25 or 6 to 4” – originally a hit in 1970. Although the new version stalled at #48, the band was able to continue its winning streak with subsequent singles, at least for a few more years.